For a long time now a woman on Twitter has taken it upon herself to encourage me to visit this week's bookshop. She's always been friendly and polite, giving gentle nudges and encouragement to get me to visit her favourite local, and my responses have always been 'one day'. Not because I was trying to fob her off, if anything I try to prioritise recommended bookshops, but because I simply didn't know when I'd be able to get there. Then, finally, I had a day off work and found myself travelling within 30 miles of her recommendation. 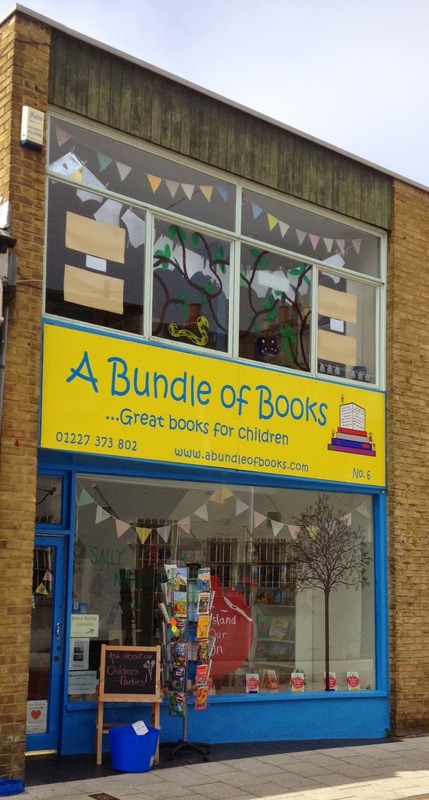 It was time to take a detour to dedicated children's bookseller A Bundle of Books in Herne Bay, Kent. On first arriving in the town I did the obligatory drive by, taking in the seafront with its coastal view to Reculver – an historic landmark I'm determined to get to one sunny day, it overlooked the edge of town, bringing a touch of the gothic to the modern world. The bookshop itself is on a wide side street near the town centre, conveniently near to on-street parking, but possibly just too out of the way to be immediately obvious to pedestrians. Not that they let such a disadvantage stop them, as I later found out A Bundle of Books is all about interaction with its community. When I arrived, on a slightly gloomy weekday afternoon, I was surprised first by how light the bookshop seemed from the inside and second how busy it was. The first was obviously a combination of the large shop window and bright and colourful displays, the second can only be a sign of the bookshop's success – something I heard more about later. 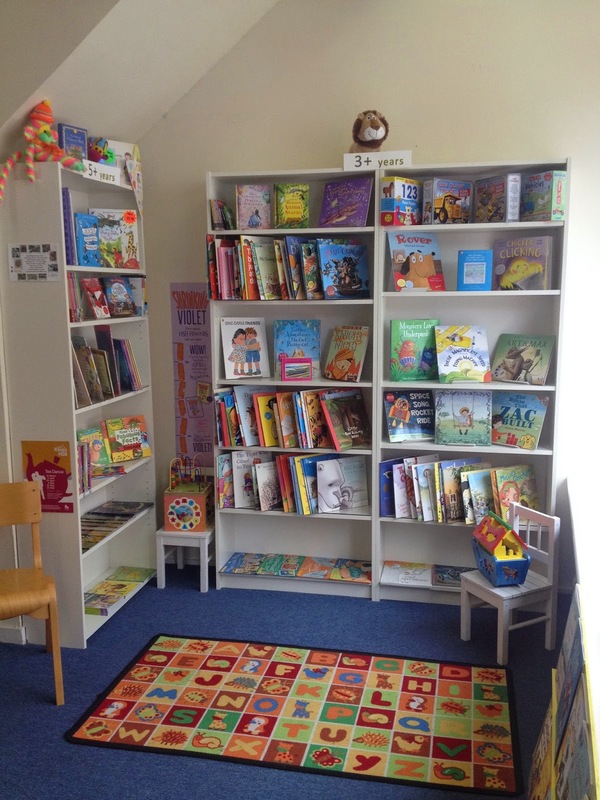 Split into two levels, the ground floor is dedicated to younger children and was where the customers were, so I decided to start upstairs with the books for older kids (aged seven plus) and young adults. Another large window continues the flow of light, with children's artwork providing decoration. At first glance there don't appear to be a massive amount of books, but once I actually started looking it became obvious that quality is more important than quantity, saving young browsers the trouble of being overwhelmed and almost guaranteeing they can't go wrong. And the bookshop is by no means empty. With books arranged according to age, there's a nice variety for each grouping and I soon found myself absorbed in the range of titles, wondering whether to choose a popular favourite or a less familiar author. At this point in my visit I'd generally approach the bookseller for advice, but leaving my browsing reverie I tuned into the conversation going on downstairs. A customer had popped in to discuss arrangements for a children's party to be held in the bookshop a few days later*, and the more I listened the more I wished I could come along. With book-themed games and activities – all organised by the bookseller – this was my idea of the perfect birthday, and as a not uncommon event in the bookshop it sounds like the perfect way to help enthuse young children about books. And so, while happily/nosily enjoying the thought of all that fun, I turned to twitter for my recommendations from among the young adult shelves. 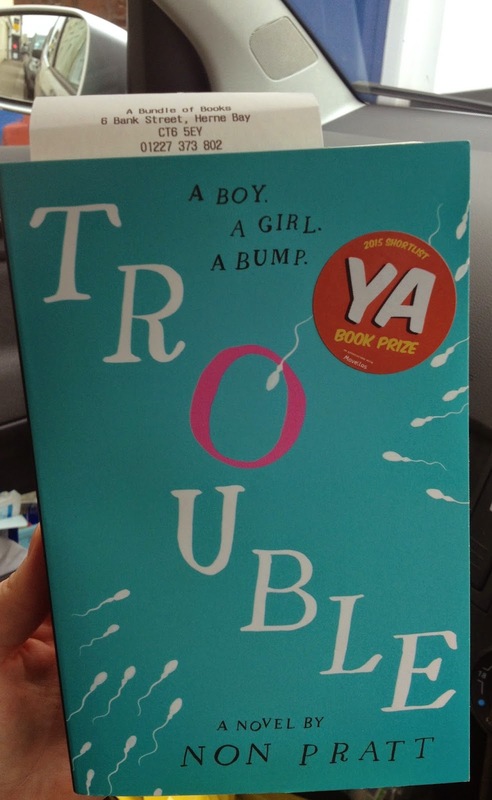 Within minutes @charlieinabook and @theprettybooks had come to my aid with some great suggestions, eventually leading to my choice of Non Pratt's Trouble. Armed with a purchase, I made my way downstairs just as the birthday party conversation began to wind up, leaving me just enough time to explore the books for younger children (I fell in love with a number of picture books) before saying hello to the bookseller. Run by a team of two, I'd turned up on one of their days off and, typically, missed the bookseller I'd been introduced to via Twitter, but even so we were soon deep in conversation about children's books, authors and the bookshop we were stood in. A Bundle of Books is just a few years old, but I was amazed by how involved it's already become in the community with a range of book clubs for children and adults, author events and a focus on developing relationships with schools. They've even recently been granted funding in the second round of James Patterson grants to bookshops. It may have taken me a while to get to this bookshop, but with all its dedication to spreading the bookish word I know A Bundle of Books is here to stay – which is good news for my planned return (and Reculver) visit, but even better news for the young people of this Kent coastal town.